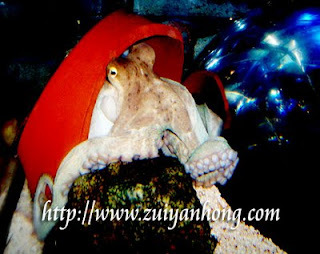 Paul was a renowned octopus in Germany Oberhausen Aquarium. It had the ability to predict precisely the result of the 2010 FIFA World Cup. It's pretty coincident that there is an octopus in Seoul Coex Aquarium. I wonder this octopus is as capable as Paul. A couple of months after 2010 FIFA World Cup over, Paul ended its mystical life. Will another miraculous octopus appear during the 2014 FIFA World Cup which will be held in Brazil, South America?